This delicious loaf is sneaky! While flavourful and light, it’s also very nutritious. Applesauce, cinnamon and low fat yogurt combine to make a batter that is tasty and moist, while the whole wheat flour adds fibre and the quinoa flakes add all sorts of goodness – including protein. Quinoa flakes are available at many natural food stores and they can be used to boost the wholesomeness of all sorts of things. If you are substituting quinoa flakes for flour in a recipe, be sure to add a little bit more liquid to compensate. 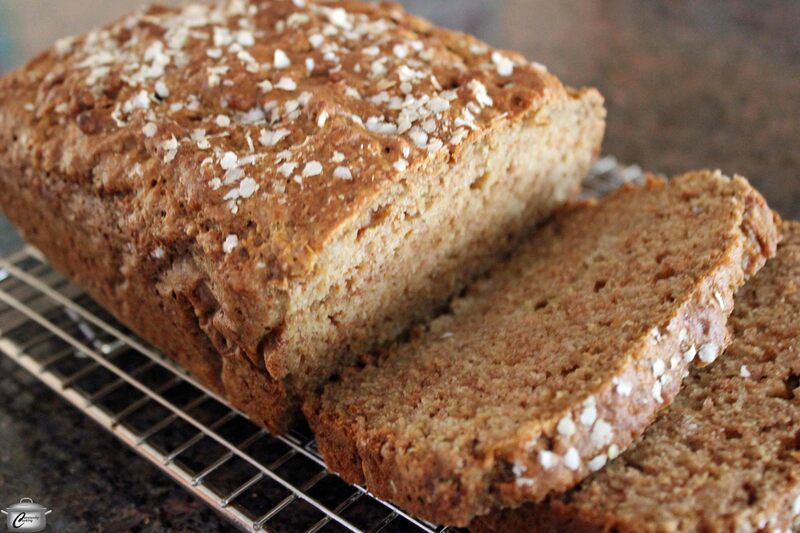 Make a double batch of this loaf recipe so you can enjoy one and give the other to a friend. Don’t be surprised if people mistake this loaf for cake. The applesauce adds a ton of flavour and the quinoa flakes give it a slightly nutty taste along with a whole lot of nutrition. Preheat oven to 350F; place rack in the middle of the oven. In a large bowl, whisk together the flours, cinnamon, baking powder, baking soda and salt. Stir in the currants or nuts if using. In a medium bowl, combine the yogurt, oil, brown sugar, vanilla, beaten egg and applesauce. With a silicone spatula or large spoon, lightly fold the wet ingredients into the dry ingredients just until all are combined. Sprinkle 1/3 cup quinoa flakes over batter and stir again just enough to blend well. (As with muffins, loaf batters should not be over mixed or the baked goods will be a bit tough). Scrape the batter into the prepared pan, trying to make it as level as you can. Sprinkle 1 teaspoon of quinoa flakes over the top of the loaf (can substitute with 1 tablespoon chopped nuts if desired). Bake for about 45 to 50 minutes, or until the loaf is nicely browned and a toothpick inserted in the centre comes out clean. Remove from oven and place on a wire rack. Let cool about 5 minutes before removing from pan. Let cool another 15 minutes before slicing. Serve warm or at room temperature; if storing for more than 2 days, freezing is recommended. This entry was posted in Uncategorized and tagged applesauce, cinnamon, loaf, low fat yogurt, nutritious, quinoa flakes, whole wheat flour. Bookmark the permalink. i love hearty breads, i can’t wait to make this! This one is so hearty yet still fairly light – I love it!